Background: As the major product in international tea market, black tea accounted 75% of global tea trade in the world. China is the headstream of black tea as well as the major production country in the world. In recent years, the trend in consuming black tea has been rising, which gives big opportunity for the fast promotion and effective development in the black tea industry. Objective: To make a comparative study on the qualities of the black teas made by floral black tea technique and the traditional process technique. 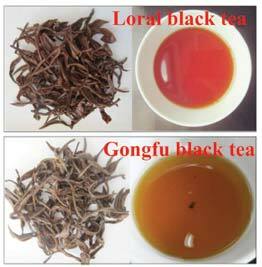 Methods: Four oolong cultivars were processed into black teas and their qualities were investigated. The qualities of floral black teas were assessed by means of sensory tests, physical and chemical analysis. The national standards (GB/T23776-2009) of China were followed for the sensory tests of the samples. Results: The black tea made by floral black tea technique had rich floral and fruity scents, tasted sweet, mellow, fresh and brisk, with obvious floral and fruity taste. Its fermentation of infused leaves was better than traditionally processed black tea. Conclusion: The quality of black tea processed from floral black tea technique was superior to the tea processed from traditional black tea technique. Floral black tea technique could greatly improve quality of black tea that processed from oolong cultivars. Black tea, oolong tea, process, quality, tea cultivars, tea. Zhangzhou College of Science and Technology, Zhangzhou 363202, China., Haixi Institutes, Chinese Academy of Sciences, Fuzhou 350002, China.